The new BBVA Compass Stadium is a state-of-the-art, open-air stadium designed to host Houston Dynamo and Houston Dash soccer matches as well as additional sporting and concert events. It opened on May 12, 2012, and the 22,000-seat stadium was the first soccer-specific stadium in Major League Soccer located in a city's downtown district. Aside from Major League Soccer and international soccer matches, the new BBVA Compass Stadium hosts Texas Southern University football, concerts, boxing matches, and much more. With its downtown location, the stadium is a part of a true Stadium District, which features Minute Maid Park and Toyota Center, as well as the George R. Brown Convention Center, and Discovery Green. 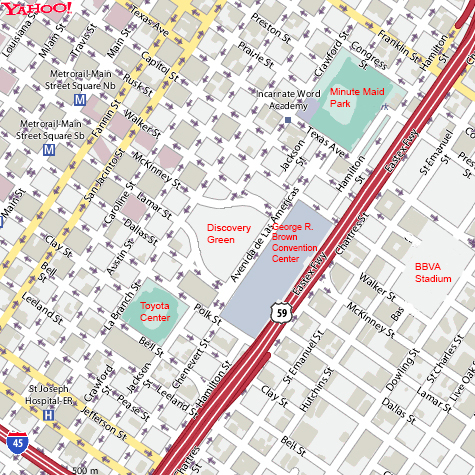 The BBVA Compass Stadium is located just east of downtown, bordering Texas, Dowling, Hutchens, and Walker.